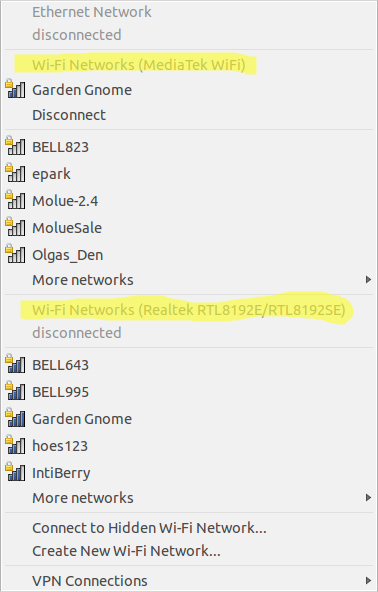 Ubuntu 14.04: How do I disable Realtek RTL8192E/RTL8192SE wifi driver? I'm a newbie and confused!! Your help will be greatly appreciated on this one! Thanks!! Then reboot and run: dmesg | grep 819 or lsmod | grep 819 to make sure its no more loading. Thanks everybody for all your help. I just learned a whole bunch that I wasn't aware of by reading your posts. The answer for me was to identify and blacklist the offending module which it turns out was r8192e_pci and not other ones I had previously added to the blacklist.conf file (the hardest part for me in the end was to properly identify the module that I didn't want loading). Even though it has rtllib as a dependency, doing 'blacklist r8192e_pci' appears to be enough to stop it from loading. Not the answer you're looking for? Browse other questions tagged 14.04 networking drivers realtek or ask your own question. How to blacklist kernel modules? What to do when you install a new Wifi card? Wifi Driver not found in Ubuntu 18.04 for my laptop HP 15-bs658TX?